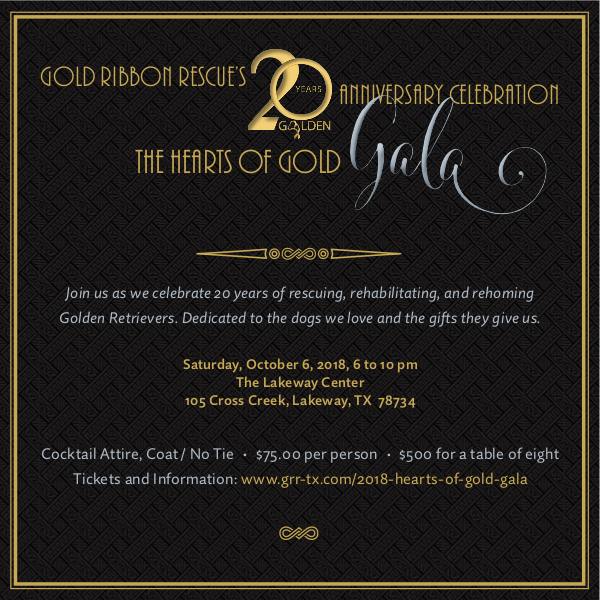 Join us as we celebrate 20 years of rescuing, rehabilitating and rehoming Golden Retrievers, dedicated to the dogs we love and the gifts they give us. A French Inspired Dinner by Food! Food! 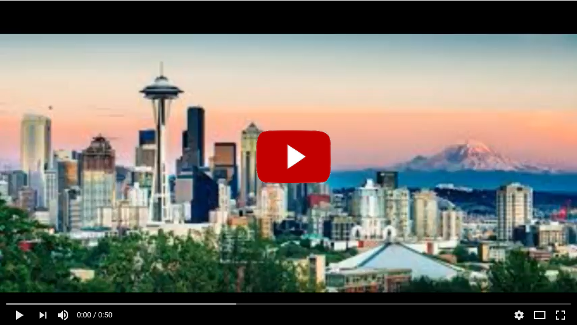 Two Alaska Air tickets paired with 2 nights at the Seattle Renaissance Hotel and 1 night at the Seattle Fairmont Hotel –	includes breakfast at the hotels. Two nights at the exclusive Old Mill Creek Retreat on 40 acres outside Brenham complete with a 5,000 square foot home that accommodates up to 10 adults, 10 kids and 10 dogs plus a dog-friendly swimming pool and pond --- a perfect weekend getaway for 2 and 4-legged creatures. 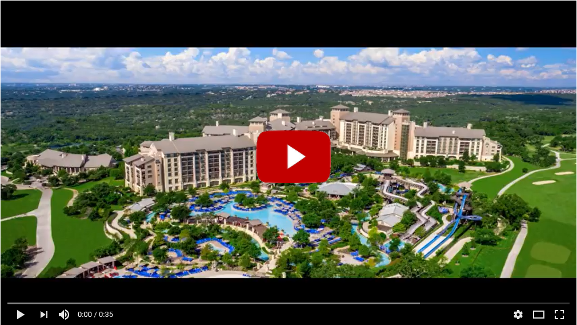 Two nights at the luxurious JW Marriott San Antonio Hill Country Resort and Spa – includes the 9–acre River Bluff Water Park on the property. Treat friends and family to a private 2-hour wine tasting led by a Total Wine & More expert – sample 8 wines from a themed tasting: California Dreaming, An Inspiring Taste of Italy or Tour de France. 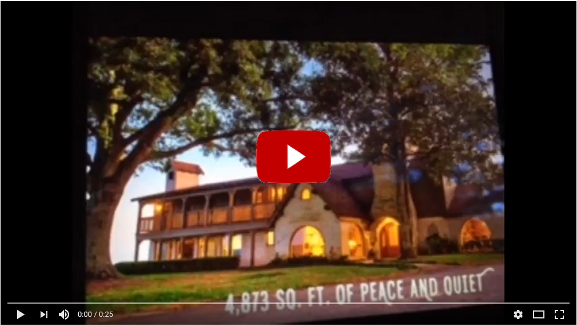 Fun Austin activities for you and your kids / grandkids – includes tickets to ZACH theater production of A Christmas Carol, Round Rock Express Baseball, The Thinkery and more. In memory of every one of our beautiful, loving Goldens: Alex, Kaibab, Trooper, Jodi, Sammie, Ranger, Redford, and our honorary Golden girl, Maggie. And for our two present Goldens who bring us such joy: Mickey and Ms Sawyer! In honor of our two GRR fur babies, Shepard and Buffy. In honor of our rescue Murphy (17-118). We are so grateful to GRR for bringing him into our lives. In memory of "Redford" Neillie. In memory of our GRR golden, Comet, (06-161). A huge Golden thank you for your support in helping to rescue and place over 150 dogs in loving homes each year! You are welcome to extend this invitation to friends. 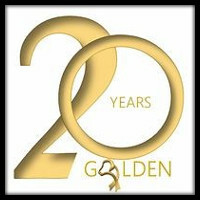 Gold Ribbon Rescue is an all-volunteer, 501(c)3 non-profit organization. It is recognized as a rescue organization by The Golden Retriever Club of America, Inc. Member dues, adoption fees, fundraising events and donations finance its activities. 100% of the funds received support golden retrievers.